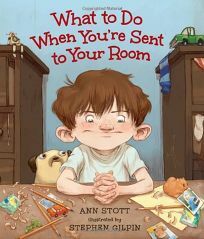 Storyline: Ben has enough experience to write a self-help book about what to do when you are sent to your room. He has it mastered, a sign that he has done it a lot. He says that he gets sent to his room for feeding the dog his dinner but, from what we read, we pick at other reasons as well. He shares his room – a messy space filled with toys and knickknacks everywhere – with his brother. There’s also a fish and a hamster living there. But don’t be fooled, Ben knows where everything is and what every thing does. When sent to his room he has a strategy. At first, he writes the apology letter just to get it out of his way, then he gets on with his things, some of them quite good, like pencil sharpening or working on his wish list. Also, he puts posters on the wall, plays with his pets, or shoots soldiers around with a slingshot, sometimes breaking the window, or makes funny faces at his brother who plays baseball in the yard. His list of things to do is divers and ingenious, and contains, also, some tricks. Like what can trigger an early release from the room, where can you hide your snack, or how to remind your dad, asleep on the couch, that your time is up. All said and done, it looks like Ben has a very good time when he’s sent to his room. Afterwards, it is his magical place. Illustration: Stephen Gilpin signs the illustration of this book. His drawing is big and bold filling up the whole page. The colors – mostly a neutral combination – are well chosen to match. Ben, the main character, is a likable mischievous looking kid with a big head and a brown mane. The illustration is very well detailed and if you look long enough you can see the week-old banana peel on the window. So, kids won’t get bored shuffling through the pages of this book by themselves. Because every page is a story on its own.